The Party is organizing a world-wide revolution again - coming to your neighborhood beginning September 17, under the title "Occupy Wall Street." It appears that cockroaches are not only best friends of the modern revolutionary, but also the role models! with the People's Cube leading the way! As for the very last link, the NKVD is already investigating who chose that silly title without asking me first. The saboteurs shall be punished! The above sites are filled with amateur agitation and propaganda materials. I have already improved on some of them (see above and below). Feel free to create more acceptable visuals out of their feeble sketches and post them here. What is our one demand? FREE RIDES! 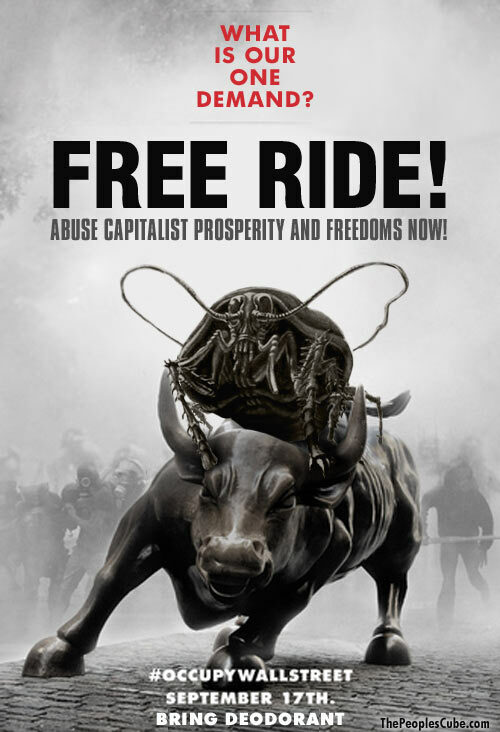 Abuse capitalist prosperity and freedoms now! Oh, and do you think these could be made into nice T-shirts and bumper stickers? Comrade Square - may I call you Red? - I am shocked - SHOCKED!! - that these proles would dare to use a word such as "square" without proper Party approval (and appropriate/sufficient bribery). Indeed, this so-called "Day of Rage" leaves one longing for those delightful days of, say, Tian'anmen Square (no relation, I'm sure), or even the Bastille (all six prisoners included at virtually no additional charge). First it was "Raves". Now it's "RAGE". I sure hope Vibeka Lyman will be providing the fire for this event. Comrades, may I respectfully say WHAT THE FLUCK? Flash mobs being only the beginning - we need to think big, comrades! Hoovervilles! Global chaos! joblessness and freelove between unwashed persons! These are the things of the future... a future so rosy it will make the streets run RED! (quickly packs his bags and starts to head north with the wife and children). We must attack on all fronts. As always, you are so right left-- How fortunate we are that cockroaches are now formally recognized (even by the United Nations) as our Allies. They've had enough of the Capitalist Abuser of Mother Nature's Creatures (a.k.a. Orkin Extermination) attempting to obliterate them from The Planet. How can they forget or forgive the spine-chilling (well, it would chill cockroaches' spines if they had spines) commercials in which Orkin guarantees to exterminate cockroaches simply desiring to enjoy a warm hot-tub with the Earth-Spoiling Humans. They will be great allies for us in our war against Capitalism in favor of our Fearless Leader's Progressive New Philosophy known as Capitolism. I'm confused Comrades. We're going to throw shoes at Wall Street? Comrades, let's not forget to thank the sponsors of this glorious revolution against capitalism, without which this protest would be impossible: cell phones, the internet, Google maps, Starbucks, George Soros, Apple, Nike, and last but not least, Michael Moore. Czar Czar, I suspect that you'd also find, not far below the surface, SEIU and ACORN (regardless of what they're now calling themselves), as well as the usual collection of wackos freedom fighters and provocateurs forward thinkers. People, if you still haven't yet, you really need to read Ann Coulter's new book "Demonic" - it has little to do with demons and everything to do with the history of mobs. Her timing was exquisite. Is that strawberry ice cream??? I Love strawberry ice cream!!! It's quite suitable that your postings above remind us of the importance of ice cream, which, of course reminds of of the importance of minimizing stresses on Cows caused by mass-production dairies, the avoidance of which inspired our Most Progressive Ice-Cream of All, (but which, paradoxically, may be Barney Frank's least favorite, which may be unsafe for work). "absolutely no rioting, no looting, no violence, no property destruction"
"Let the US Days of Rage begin..."
PPS: if you bring deodorant, make sure it has not been tested on animals or little orphans. Or else you will be reported to PETA. You simply must vent your rage in an imaginative fashion. Ahhhhh, I has it. See something, destroy something - but peacefully. Thank you, comrade. Could someone bring a tanker truck filled with air freshener to Wall St.? The odor is still wafting all the way down here to the People's Commonwealth of Virginia, Northern District. 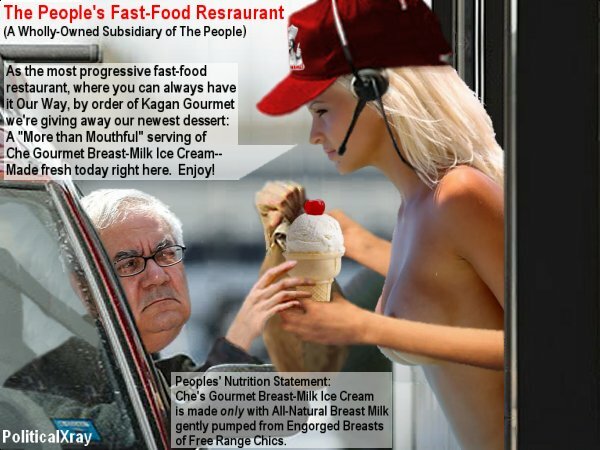 Liberate Wall Street: Infiltrate and Humiliate!